Readers today can access books in several common digital formats, but print books remain substantially more popular than either e-books or audio books. Roughly two-thirds of Americans (65%) have read a print book in the last year, which is identical to the share of Americans who reported doing so in 2012 (although down slightly from the 71% who reported reading a print book in 2011). By contrast, 28% of Americans have read an e-book – and 14% have listened to an audio book – in the last year. 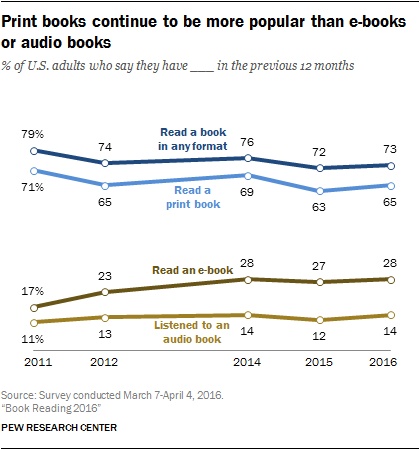 In addition to being less popular than print books overall, the share of Americans who read e-books or listen to audio books has remained fairly stable in recent years. E-book readership increased by 11-percentage points between 2011 and 2014 (from 17% to 28%) but has seen no change in the last two years. Similarly, the share of American adults who listen to audio books has changed only marginally since Pew Research Center first asked about this topic in 2011 – at that point, 11% of Americans had listened to an audio book in the last year, compared with 14% now. 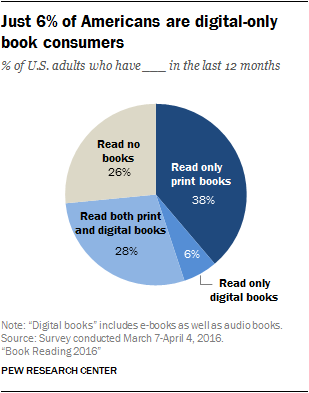 More than one-quarter (28%) of Americans read books in both print and digital formats (which includes e-books and audio books). Some 38% read print books but did not read books in any digital formats, while just 6% read digital books but not print books. 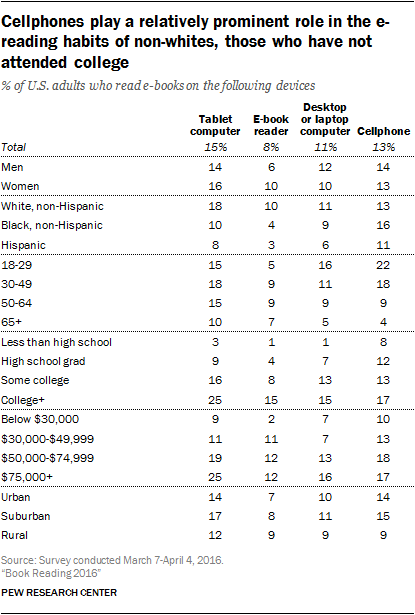 Relatively few Americans are “digital-only” book readers regardless of their demographic characteristics. However, some demographic groups are slightly more likely than others to do all of their reading in digital format. For instance, 7% of college graduates are digital-only book readers (compared with just 3% of those who have not graduated from high school), as are 8% of those with annual household incomes of $75,000 or more (compared with 3% of Americans with incomes of $30,000 or less). Interestingly, young adults are no more likely than older adults to be “digital-only” book readers: 6% of 18- to 29-year-olds read books in digital formats only, compared with 7% of 30- to 49-year-olds and 5% of those 50 and older. Tablet computer and smartphone ownership have each increased dramatically in recent years, and a growing share of Americans are using these multipurpose mobile devices – rather than dedicated e-readers – to read books. Between 2011 and 2016, the number of Americans who read books on tablet computers has increased nearly fourfold (from 4% to 15%), while the share who read books on smartphones has more than doubled (from 5% to 13%). The share of Americans who read books on desktop or laptop computers has also increased, although by a more modest amount: 11% of Americans now do this, up from 7% in 2011. 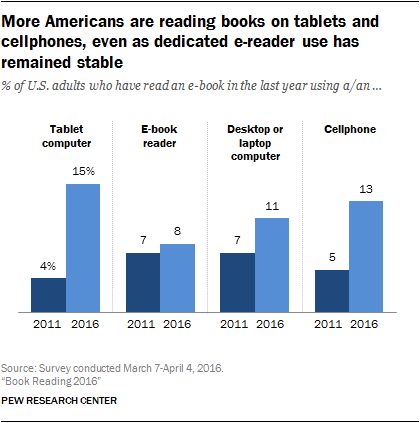 By contrast, 8% of Americans now report that they read books using dedicated e-reader devices – nearly identical to the 7% who reported doing so in 2011. Previous Pew Research Center studies have documented how several groups – such as blacks and Latinos, and those who have not attended college – tend to rely heavily on smartphones for online access. And in the context of book reading, members of these groups are especially likely to turn to smartphones – rather than tablets or other types of digital devices – when they engage with e-book content. In addition to asking whether – and on what devices – Americans read books specifically, the survey also included a broader set of questions asking about reasons that people might read written content of any kind (including books, but also magazines, newspapers or online content). In some cases, the factors associated with high rates of book readership are the same ones associated with reading for specific purposes. For instance, college graduates are more likely than those who have only attended high school to read books in general – and they are also more likely to read for all four of the specific motivations examined in this survey. At the same time, there is not always such a direct relationship between book reading and overall reading for specific purposes. 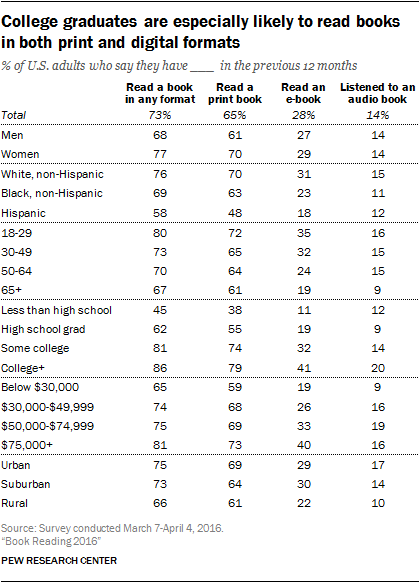 As noted earlier in this report, young adults are more likely to read books than older adults. And when asked about specific reasons why they might read a range of content, these young adults are much more likely than older adults to say that they read for work or school, or to research a specific topic of interest. 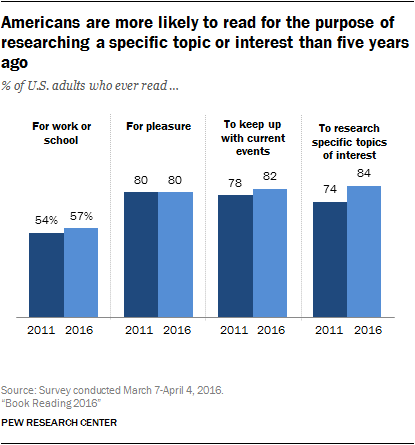 However, Americans of all ages are equally likely to indicate that they read (whether in book form or otherwise) for pleasure or to keep up with current events.